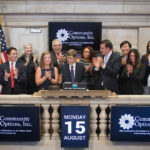 New York Stock Exchange | Community Options, Inc. 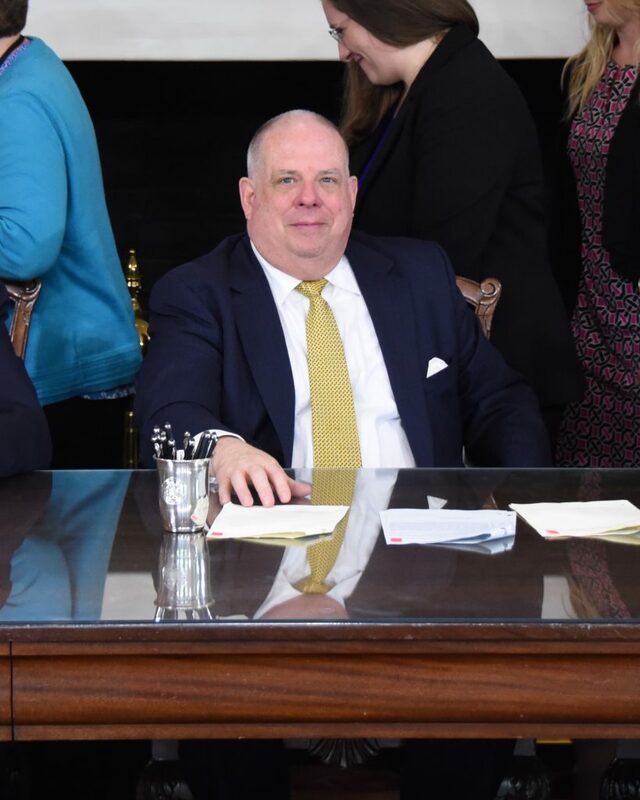 Governor Hogan has not only proven to be one of the most pragmatic governors in Maryland’s history, but an astute advocate for persons with disabilities. He knew that he had to surround himself with dedicated people who provide public service, and with unflappable professionals dedicated to improve the lives of Maryland’s most vulnerable citizens. In tandem with Deputy Secretary Simons, persons with significant disabilities relegated to live in a state institution in Massachusetts which uses punitive treatment, are now returning home. Community Options has worked with the executive and departmental leadership of Maryland and has 12 small homes opened or in development to accommodate over 40 people with disabilities. The result is not only quality care, but will also create over 100 jobs for caregivers in the state of Maryland. Brian Dion, Regional Vice President, has opened two offices in Maryland and is not only focused on purchasing beautiful homes for the newly returned citizens, but also to find jobs and meaningful day services. 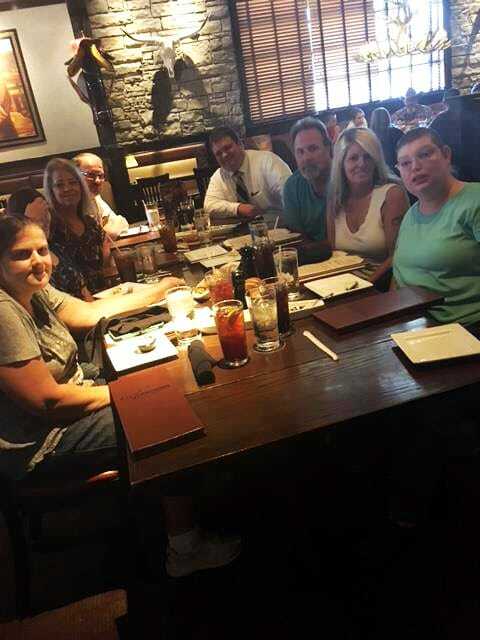 With the assistance of Kim Herndon and Madeleine Will, a notable business advisory committee is being formed to augment the direction and vision for this terrific group of professionals who are ready to implement supports for persons with disabilities. 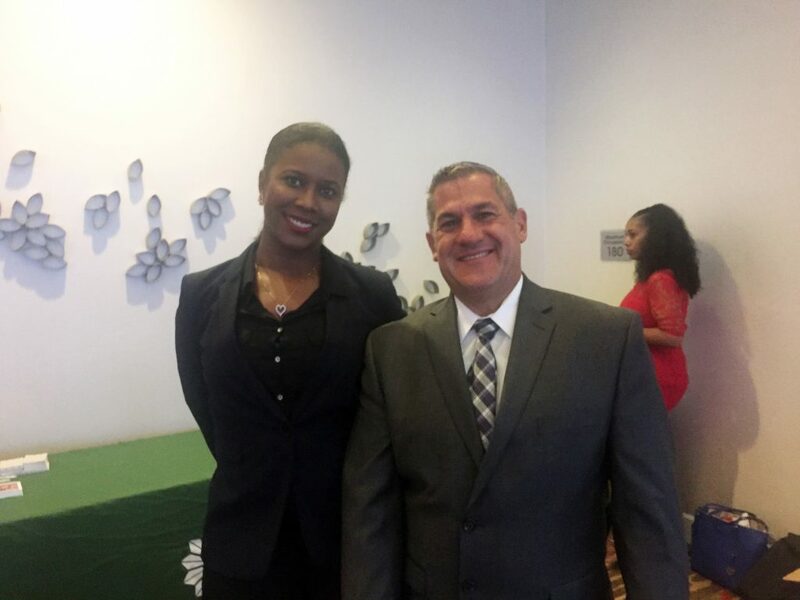 Tanisha Thorpe, the Children’s Director Maryland with Brian Dion, Regional Vice President, Arizona, Maryland, New Mexico, Pennsylvania, and Utah. Still, the board of directors knows that this would not happen without the fortitude and leadership of Governor Hogan. He has won personal battles for himself and always helps others to win their battles as well. Robert Stack, President & CEO of Community Options with Phil. Phil was the first person to move into our Maryland home. Community Options now supports over 60 people in that state. Community Options is committed to fostering the professional growth of staff through training and development opportunities. We recognize the need of developing our bench strength through leadership and management training initiatives that prepare staff for future leadership roles in the organization. The Leadership Academy is a Community Options succession planning initiative which seeks to identify, train and develop key employees to ensure the organization has a pipeline of future leaders. The Leadership Academy is a highly competitive one-year program. The Leadership Academy is currently in its 4th round of developing 15 high potential staff throughout the organization. To date, 42 active alumni continue to advance the mission of the organization through their leadership at Community Options. Vaseful Flowers and Gifts is a charming flower shop that offers high quality floral services and delivery to anywhere in the world. We are committed to serving our customers with the finest floral arrangements and gifts, backed by our 24-hour guarantee. Vaseful is owned and operated by Community Options Enterprises, Inc., a non profit organization that supports people with disabilities. “I love to make money and see how good the yard looks after I’ve mowed the grass,” says Harmon. Kyle Harmon started his lawn care business with two yards and a push mower. He expanded his services with a borrowed weed whacker from Community Options Quality Assurance Coordinator Ryan Vinson. With such quick success and a desire to give high quality service, Kyle saved enough money to purchase a new one. A lover of the outdoors, Kyle has enjoyed mowing lawns from a very young age. He would often mow the lawn for his foster parents. Kyle was referred to Community Options by the Department of Children’s Services, as he had come of age when he could no longer be in the foster care system. 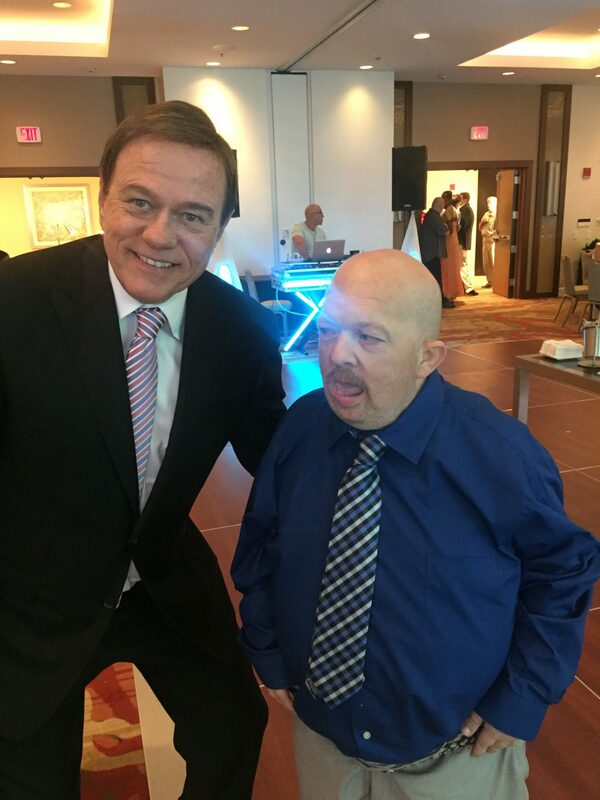 Since coming to Community Options, he has received supported living, community-based day and supported employment services with the national nonprofit organization. Kyle’s first customer was his neighbor, who needed someone to mow his lawn at a reasonable rate. The neighbor could no longer handle the manual labor or yard maintenance. Kyle and his lead staff, Ashley Gentry, submitted a bid to the neighbor and earned the opportunity. The second yard was secured when a Community Options employee was looking for someone to mow his sloped yard, as he lacked the time to handle the responsibility. He was given a John Deere riding lawn mower by a staff member this year, enabling him to secure two additional yards. With business going so well, Kyle purchased a trailer to transport his riding lawn mower. “Kyle is still learning the art of mowing and needs direction. 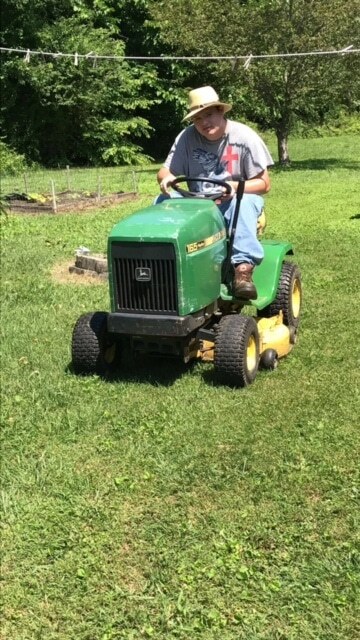 As he continues to provide mowing services to his customers he will gain more knowledge and eventually be able to mow with little to no direction from his job coach,” said Jeanette Preece, Community Options’ Executive Director of Cookeville, TN. Kyle currently maintains a total of four lawns and is hoping to increase that number to six by the end of the year. Community Options’ Cookeville office serves 20 individuals with intellectual and developmental disabilities, provides residential support with 10 area homes and supports six individuals who are currently employed in the workforce. 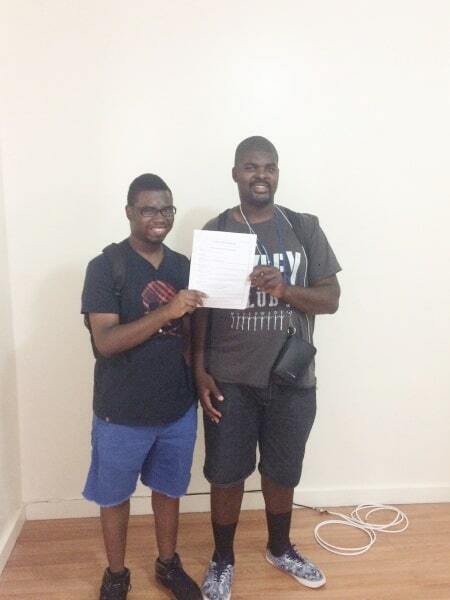 Keith Baxter-Young and Andrew Daniels hold up the lease agreement to their new place they moved to in July. Community Options’ mission is to provide housing and employment support for individuals with intellectual and developmental disabilities. In early July, Keith Baxter-Young and Andrew Daniels moved into a residential building as roommates in the Harlem section of New York City, living independently for the first time. Baxter-Young, 23, came from the foster care system in August 2015 after living in Queens. Daniels, 24, had lived with his family in Manhattan until he moved to Community Options in September 2014. New York Office for People with Developmental Disabilities’ Individual Support and Services (ISS) assists adults with developmental disabilities who wish to live independently. The division provides funds to pay for housing costs, and on a limited basis, for items such as food, transportation and clothing. Rent for their new residence is $2,000/month, with the subsidy paying $1,400, leaving Baxter-Young and Daniels with a $600 bill to split. Also through the program, they received $3,000 each for set up costs for various expenses such as furniture, and real estate fees. Baxter-Young has worked at Target for a few months and Daniels is actively seeking employment. They were approved to receive 5,200 hours of services through Community Habilitation/Recreation in addition to Employment and Day Habilitation services. Community Options has appointed Michele McGregor as Vice President of Mission Advancement. In her new position, McGregor will be responsible for grant development, essential training, leadership training, individual and major gift development as well as special event implementation. McGregor will work to create a culture of philanthropy within Community Options and provide both strategic direction and tactical oversight to all aspects of fundraising and communications. 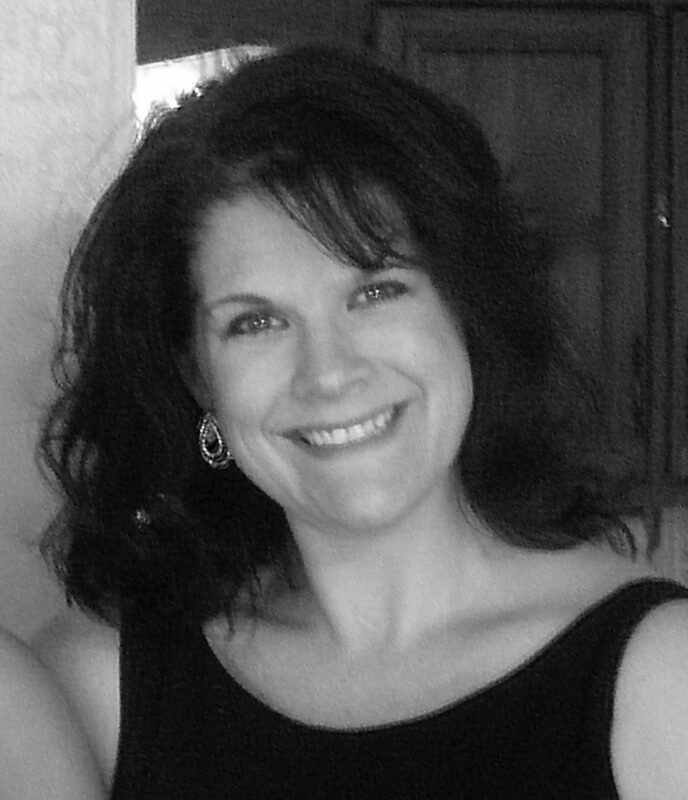 McGregor joined Community Options in 2012 as the Assistant Executive Director in Pittsburgh, PA and in 2014, Michele was promoted to the State Director of Quality Assurance for Pennsylvania and then shifted to National Quality Director before her current post. Annual iMatter Conference at the Francis Marion Hotel from September 24-27. 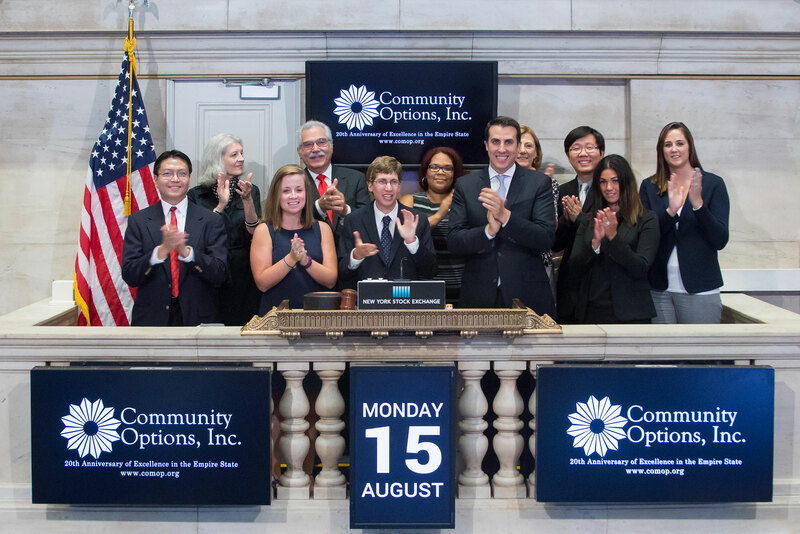 To honor the occasion, Phil Lian, Board Member, rang the NYSE Opening Bell®. and Cristy with their parents. In March 2017, Community Options expanded services to Utah. In a matter of just a few months, Community Options has made noticeable progress in providing housing and employment supports to individuals with intellectual and developmental disabilities. With over 20 years’ experience working with people with disabilities and employment services, Shannon Wilkins was hired as the Director of Employment Services. Utilizing her knowledge of programs and established relationships with funding sources, Wilkins cultivated a relationship with the Vocational Rehabilitation Department and Division of Services for People with Disabilities to provide employment supports. Sharing the same progressive, inclusive philosophy as the state, Community Options obtained funded support for 23 individuals in the Salt Lake and Weber counties of Utah. One of those individuals, Keanu Unufe, has already found employment. Keanu Unufe was about to turn 22 in May, resulting in a loss of state-provided support and a lack of formal programs. Upon his graduation from an extended education transition school, his teachers and Community Options searched for potential employment. After an assessment of Keanu’s skills and abilities, assistance in creating a resume and practicing his interviewing skills and self-advocacy, he was offered an interview with Walmart as an Associate on May 15. He now works five days a week and a total of 20 hours. Well-liked by his supervisors and co-workers, Keanu has been a welcome addition to the Walmart team. 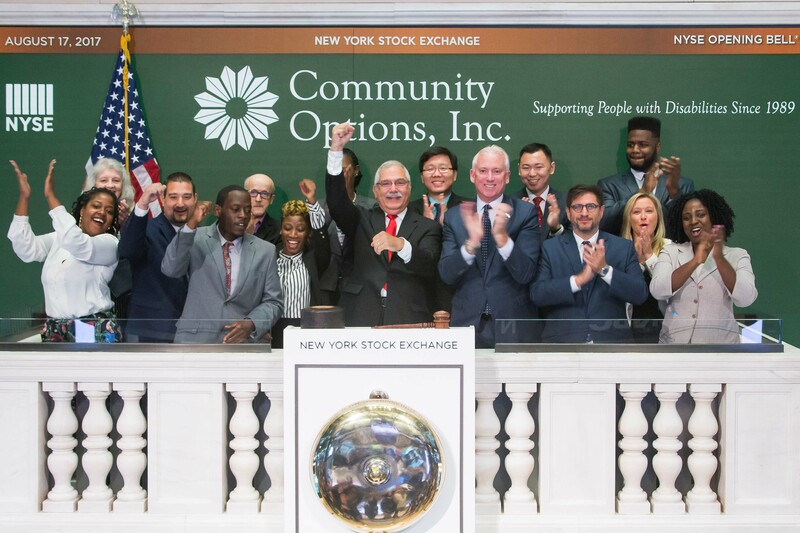 Today’s bell ringers are Phil Lian, Board Member, of Community Options, Inc. at the NYSE, and Mike Massimino, Discovery Communications, at the Nasdaq. Phil Lian, Board Member, of Community Options, Inc., at the NYSE, and Mike Massimino, Discovery Communications at the Nasdaq, ring today’s opening bells. Phil Lian, Board Member, of Community Options, Inc., at the NYSE, and Mike Massimino, Discovery Communications at the Nasdaq, ring today’s opening bells. Squawk on the Street. 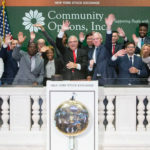 The New York Stock Exchange welcomes executives and guests of Community Options, Inc. to celebrate 10 years of providing housing and employment support to individuals with intellectual and developmental disabilities in South Carolina, Community Options will hold its 11th Annual iMatter Conference at the Francis Marion Hotel from September 24-27. 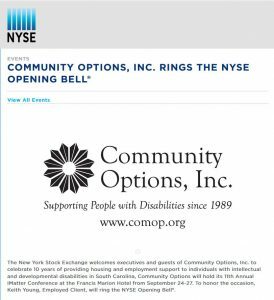 To honor the occasion, Phil Lian, Board Member, of Community Options, Inc. will ring the NYSE Opening Bell®.